Remember “Spring Forward, Fall Back?” Well it’s time to set your clocks (and watches) back to standard time. Daylight Saving Time officially ended at 2:00 a.m. on Sunday, November 4, 2012. That gives us back the extra hour we lost in the spring of this year. If you knew about the time change in advance, perhaps you slept in for an extra hour today. If not… enjoy reading the new Bulletin items for today, and definitely check out our CMP Western Games Slide show from yesterday if you haven’t seen that yet. Share the post "Set Your Clocks Back Today — End of Daylight Saving Time"
Wow. If James Bond shot F-TR, we think this is what he might use. You’re looking at the radical new Steve Jennings stock for F-TR competition. This skeletonized stock is crafted to fit the Barnard action. As you can see, there is no conventional fore-arm. Instead a carbon fiber tube extends forward of the action. At the front end of the tube, a fixture hold the beefy, forward-angled, girder-style bipod legs. These legs adjust to two heights, for prone or bench shooting. Large Delrin cylinders at the bottom of the legs provide stability and help resist bipod hop. Cost of the Jennings stock, including bipod legs and bag-rider assembly, is $700.00 at Chesebro Rifles. The rear bag-rider, which adjusts for height, is also carried by a carbon-fiber tube that runs from the bottom of the pistol grip back to the buttplate. The bag-rider is attached via an eccentric fixture. This way, as you spin it in and out, the vertical position changes. This allows you to get the elevation centered -up on the target, but this system is not designed for fast changes “on the fly”. Small changes in elevation are made by squeezing the bag. 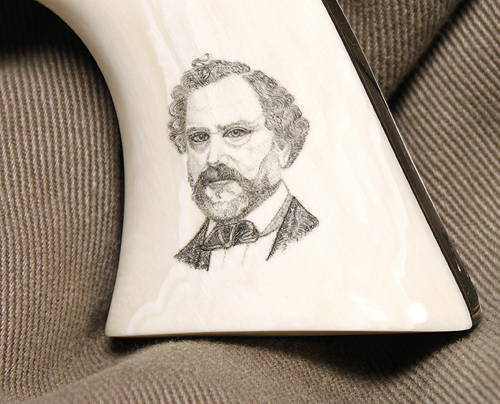 Mark Chesebro also offers a complete rifle built around the new Jennings stock. Built with a Barnard Action, Trueflite (NZ) barrel, and Barnard trigger, a complete Jennings F-TR rifle costs $2500.00. For more information on the Steve Jennings F-TR stock, or complete rifles built with this stock, visit ChesebroRifles.com or call (805) 280-5311. We hope to get our hands on one of these rigs for testing very soon! EDITOR’s COMMENT: Now it would be great if Seb Lambang’s joystick bipod head could somehow be adapted to this rig, with the joystick running under the carbon fiber “fore-end”, but still using the forward-angled Jennings girder-style legs and oversize “Coke-Can” bipod feet. That could definitely be a James Bond-worthy F-TR rig. Share the post "New Steve Jennings Skeleton F-TR Stock with Integral Bipod"
Colt Manufacturing’s 175th Anniversary Single Action Army revolver is now on loan at the NRA National Firearms Museum. The one-of-a-kind gun (serial number 175) was crafted by the Colt’s Custom Shop and engraved by Master Engravers Steve Kamyk and George Spring. 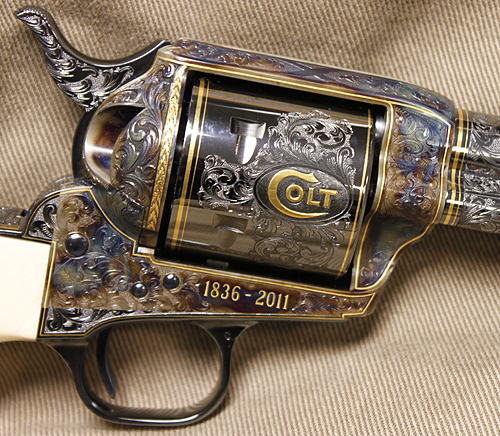 It was created “to commemorate the 175th Anniversary of Colt Firearms”, notes Timothy Looney, Custom Shop Manager. The firearm is based on the Colt Single Action Army with a black powder-style frame finished in color case hardening. The barrel, cylinder, trigger guard, and backstrap are finished in Carbonia Blue and the balance of small parts are fire-blued. 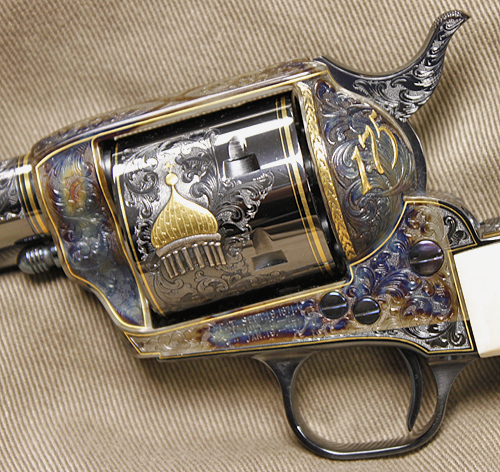 The firearm has been scroll-engraved with C+ coverage and is accented by full gold frame borders including raised running leaf on both sides of the recoil shield. The left recoil shield exhibits “175” in high-relief gold over raised-relief scroll. CLICK image squares to see larger photos. The non-fluted cylinder is highlighted by the Colt dome comprised of gold and silver raised relief and the the opposing side displays the serpentine Colt in raised gold. Hand inlaid gold bands accent the barrel and the cylinder. 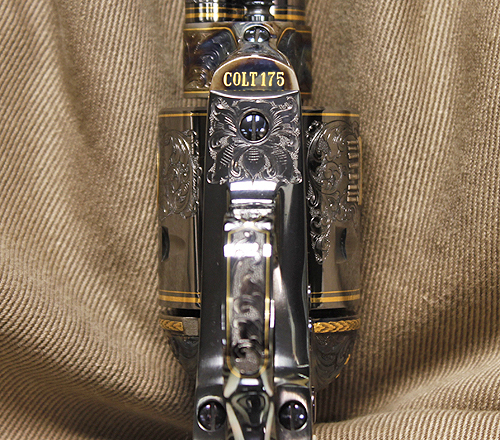 The backstrap has been engraved and gold inlaid with Sam Colt’s signature. 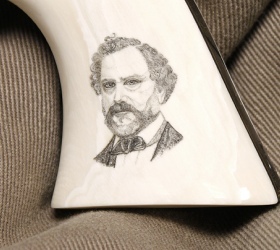 The elephant ivory grips are scrimshawed with a portrait of Sam Colt on the left side and the Rampant Colt on the right side. “The 150th Anniversary pistol was auctioned off and sold for $150,000,” explained Looney. “This one is valued at $175,000. We wanted it … where people could see it because we’re very proud of our master engravers and we like their work to be shown.” The Single Action Army Revolver will be on display at the NRA National Firearms Museum through October of 2013. Share the post "Colt 175th Anniv. Single Action Army at NRA Firearms Museum"